Ohio University Press, 9780821423035, 330pp. In recent years, anthropologists, historians, and others have been drawn to study the profuse and creative usages of digital media by religious movements. At the same time, scholars of Christian Africa have long been concerned with the history of textual culture, the politics of Bible translation, and the status of the vernacular in Christianity. Students of Islam in Africa have similarly examined politics of knowledge, the transmission of learning in written form, and the influence of new media. Until now, however, these arenas—Christianity and Islam, digital media and “old” media—have been studied separately. 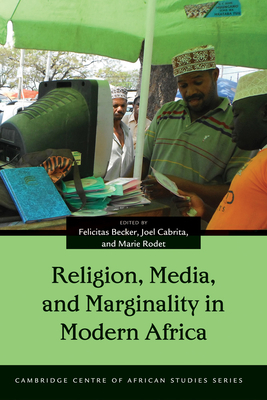 Religion, Media, and Marginality in Modern Africa is one of the first volumes to put new media and old media into significant conversation with one another, and also offers a rare comparison between Christianity and Islam in Africa. The contributors find many previously unacknowledged correspondences among different media and between the two faiths. In the process they challenge the technological determinism—the notion that certain types of media generate particular forms of religious expression—that haunts many studies. In evaluating how media usage and religious commitment intersect in the social, cultural, and political landscapes of modern Africa, this collection will contribute to the development of new paradigms for media and religious studies. Contributors: Heike Behrend, Andre Chappatte, Maria Frahm-Arp, David Gordon, Liz Gunner, Bruce S. Hall, Sean Hanretta, Jorg Haustein, Katrien Pype, and Asonzeh Ukah. Felicitas Becker is professor of African history at Ghent University, and a specialist in the history of Islam in East Africa. She is the author of Becoming Muslim in Mainland Tanzania and coeditor of AIDS and religious practice in Africa. Her current work focuses on Islamic preaching, the rhetoric of development and aetiologies of poverty in East Africa. Joel Cabrita is a lecturer in world Christianities at the University of Cambridge. She is the author of Text and Authority in a South African Church. Her forthcoming book is a history of the transatlantic Zionist movement (The People’s Zion: South Africa, the USA and a Transatlantic Healing Movement). Marie Rodet is a senior lecturer in the history of Africa at SOAS. Her research interests lie in the field of modern migration history, gender studies and the history of slavery in francophone West Africa. She is the author of Les migrantes ignorées du Haut-Sénégal, 1900–1946 and coeditor of Children on the Move in Africa: Past and Present Experiences of Migration.